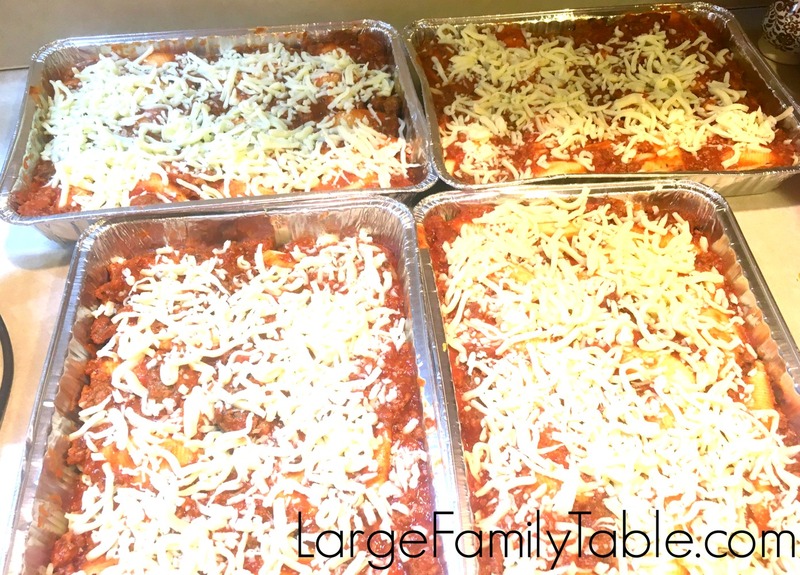 In my recent Big Family Freezer Meals cooking days I made 4 large pans of stuffed shells for my people. 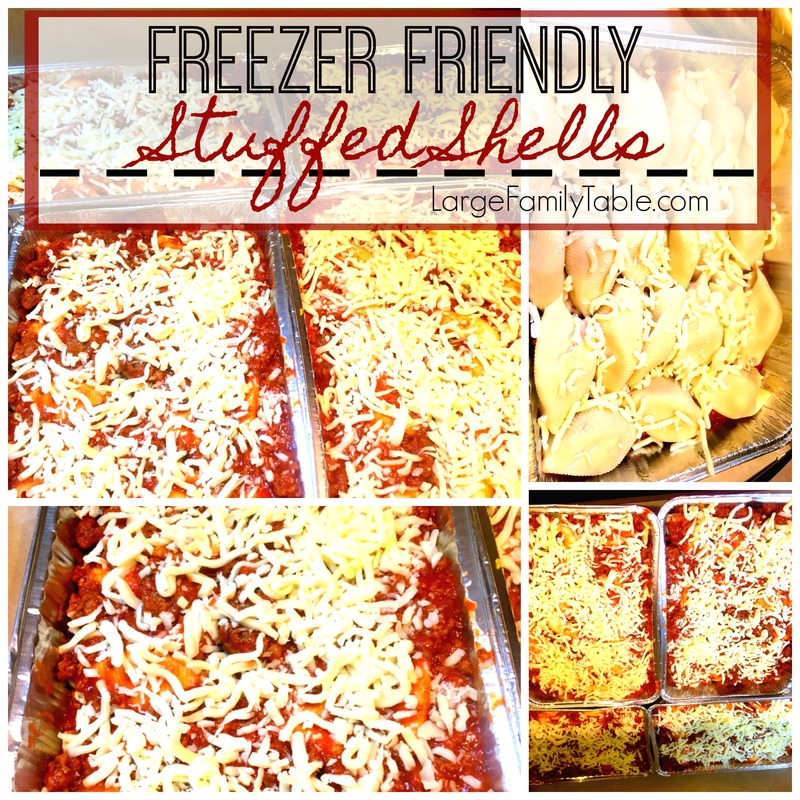 These big pans of stuffed shells freeze and later reheat wonderfully. Add a fresh salad, garlic bread, or a cup of fruit for a lovely dinner your family will ask for again and again! 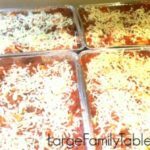 This large family recipe yields up to four 9×13 pans of fantastic Freezer Friendly Stuffed Shells! *For Homemade Meat Sauce* In a large pot mix 100 oz of Tomato Sauce, 12 oz Diced Tomatoes, and 2 lb precooked ground beef. Stuff cooked jumbo noodles with cheese sauce mixture and layer on the bottom of 9×13 pan. Cover stuffed shells fully with homemade meat sauce. Top with one cup of shredded Mozzarella cheese. Repeat for a total of four 9×13 pans. Set the desired pans of Stuffed Shells out in the refrigerator the evening before you’d like to serve them. Enjoy this hearty dish that feeds a crowd! 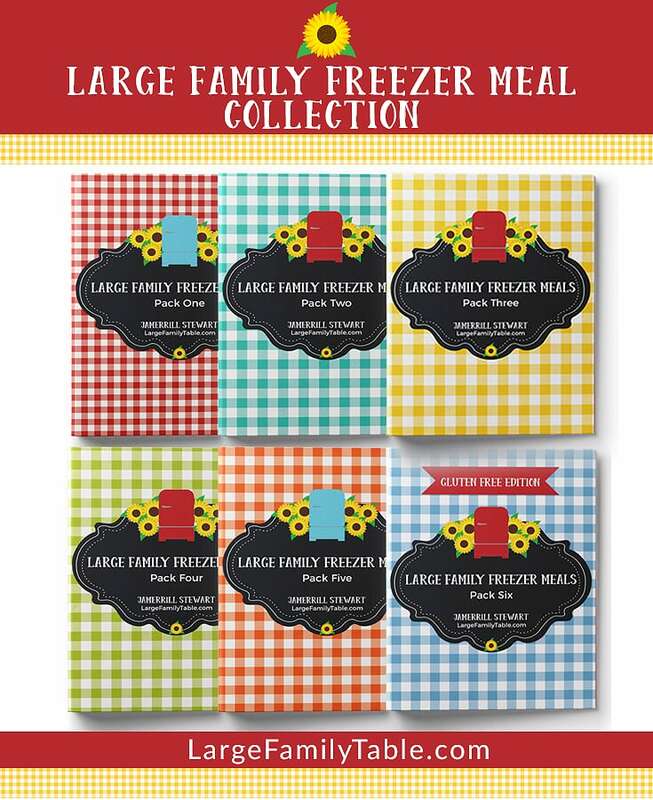 DON’T FORGET to pick up your large family freezer meal packs here! Love this recipe. 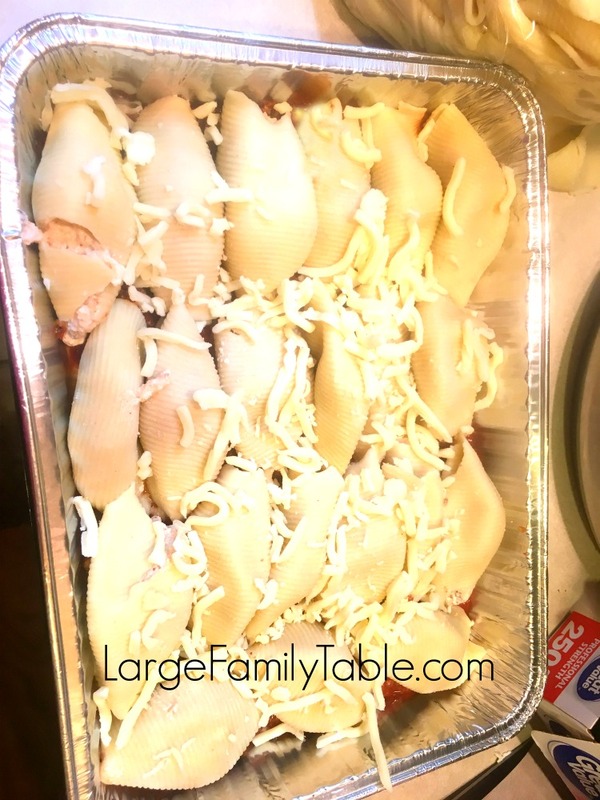 We very seldom have stuffed shells although its a family favorite as its a bit of a fussy recipe for me (read as… ya- I get lazy at dinnertime) and this will definately fix that problem. Thanks so much. Question though… we only have 3 people in our family. Yet I’m sure we would use that whole pan. My husband alone would eat at least half of that. Between dinner and leftovers for his lunch it would be just exactly enough. 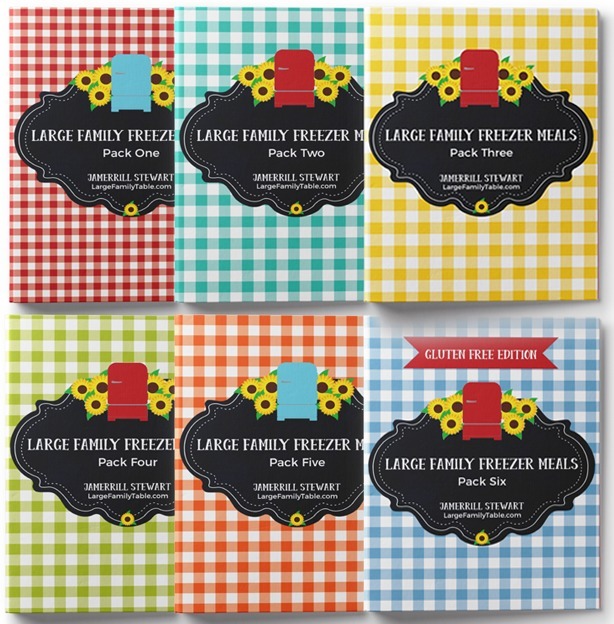 How on earth can your family 3 times as large make it? Or are those shells much larger than I am thinking? (They look like I could line up 4 of them on my hand.) Me the college boy and the hubbo would probably just have this with a big salad and garlic bread. Um,… and yes my hubby is an EATER!!! 🙂 Love the blog and the vids and the links and the kids are so adorby. Namaste. When I cook overwise, I do enough for leftovers for lunch and dinner the next day. That would mean I would need three 9×13 pans. However, if I’m using this as a freezer meal we just do one pan for that night and will have no leftovers. Everyone gets a scoop full, and I also serve a side dish like green beans and applesauce. 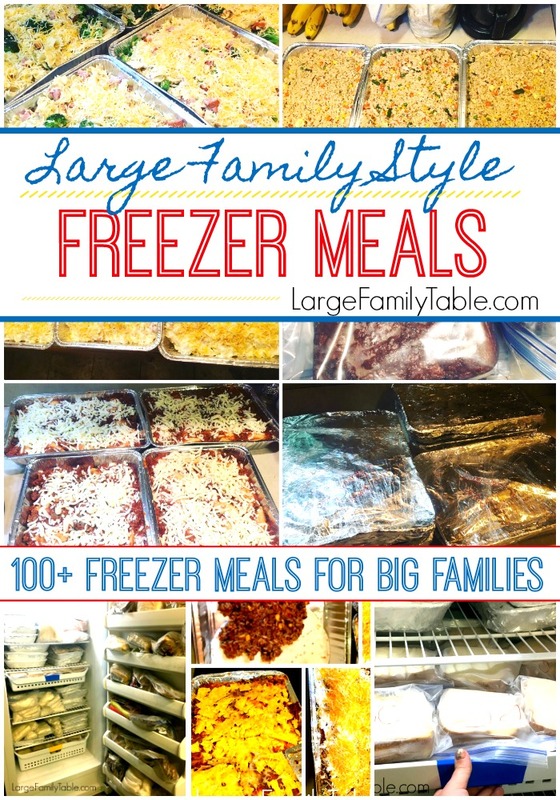 you are the only one that has recipes that my family will actually eat…lol. should I undercook the pasta? Thank you!!! Yes, try to undercook it a bit. Although I’m sure I’ve overcooked it and it has still turned great, haha. I run cold water on the noodles after cooking and that stops them from cooking farther, too. Can I use cottage cheese in place of the ricotta? Thanks so much!